Kids love to play, so when buying toys or gifts for children you need to focus on toys that will build them mentally and physically. This ensures that while they are having fun playing, they are also equipped for the challenges of the future. Here are some great learning toys and gifts for kids, especially as Christmas draws near. Counting sets helps your kid learn about numbers and helps them develop counting skills. One example is the Brainy Baby 123s Counting Collection, which comes with a 45-minutes DVD, a 16-page board book, and 36-piece flashcard set all geared towards teaching kids how to count. Brainy Baby 123s Counting Collection is recommended for kids between the ages of 1 to 4. While counting sets helps your child learn about numbers, Alphabet sets introduces children to alphabets. They are built for kids and hence developed to be fun. Brainy Baby also offers an ABCs Alphabet Collection, which like the counting collection also features a 45-minutes DVD, a 16-page board book, and a 36-piece flashcard set. Brainy Baby ABCs Alphabet Collection is recommended for kids between the ages of 1 to 4. Alphabets and numbers are very important skills for kids. So, you should buy toys that enable them develop counting and alphabet skills. 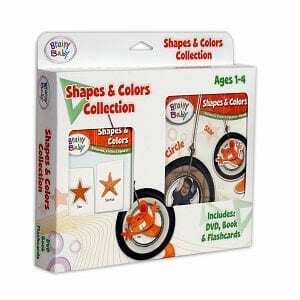 Shapes and Colours Sets helps your children appreciate shapes and colours. With toys like this, kids can sort objects by shape and colour. 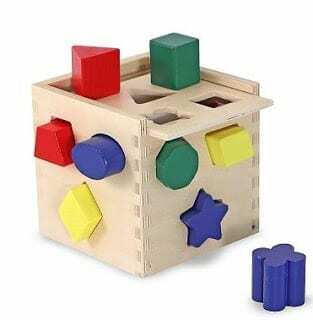 The Toys sets consists of 2 dimensional and/or 3 dimensional shapes of different sizes and colour. Brainy Baby also offer a Shape and Colour Collection consisting of a 45-minutes DVD, a 16-page board book, and a 36-piece flashcard set. Melissa & Doug also offer shape and colour sets. Building sets unlocks the creativity in your child. They are building block sets used for constructing objects like houses or bridges. If you are buying for a child less than 6 years, buy construction blocks with large building blocks as they are easier for them to hold and they cant swallow them. 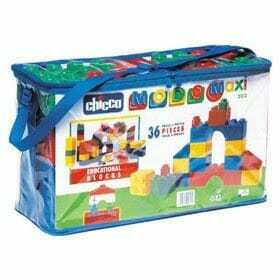 An example is the Chicco Modo Maxi Educational Blocks. Above 6 years LEGO branded building blocks will be great. Computer skills are very essential today and will even be more so in future. You can start out your kid on a bright future by buying them educational laptops. Educational laptops is great for introducing children to computers, but also come with fun activities and games that will enable your children learn letters, words, math, logic, and science. Children Educational laptops may also feature memory challenges and strategy games that will help improve the learning capacity of your kid. Educational laptops are available for kids as young as 6 months to up to 8 years and above. When buying, ensure you buy the one recommended for the age group of your kid. 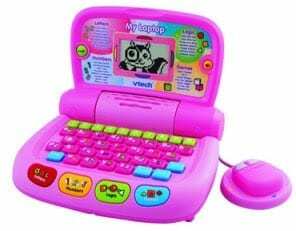 Most educational laptops sold in Nigeria are made by VTECH and price starts at around N3,500 for baby laptop. However, most of these toys will require parental guidance or the guidance of an older person to assist the child at least initially. How to Keep Tabs on Your Child with a Phone Tracking App?